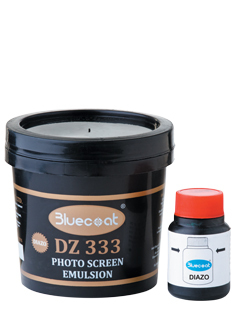 Bluecoat DZ 333 is a diazo based Photo Screen Emulsion used for the preparation of screens in textile for continuous printing with excellent resolution and high definition. Once the screen is exposed, it needs to be hardened with Bluecoat Hardener. Sensitized DZ 999 emulsion has a shelf life of 2-3 weeks when stored at room temperature.